Once upon a time, long, long ago, downtown parking wasn’t an issue for the citizens of Lansdale. We stress “long, long ago” because we have to go back to the end of World War I – 100 years ago – when the topic first became the subject of public comment. By then, the automobile had pretty much driven the horse off the roads. Henry Ford was making cars affordable for the masses and families soon put them on the “must buy” list. In earlier times – the horse and buggy days – hitching posts lined Main Street and stables were available for folks staying downtown a little longer. Then, of course, there was always that old standby – shoe leather express – which propelled most townspeople to the stores. It wasn’t unusual for mom to wheel her push cart to the grocery stores three or four times a week. Remember, too, that Lansdale was the area’s transportation center, so trains and trolleys brought many out-of-town customers to the downtown businesses. Parking wasn’t an issue for them. Times change, and so does human nature. During the 1920s and ‘30s, the car invaded almost everyone’s lifestyle, including their shopping habits. Walking to the store became a time-consuming activity that could be accomplished quickly by firing up the Tin Lizzie. It wasn’t long before drivers were vying for a limited number of curbside parking spots. As one might expect, this led to other problems. Motorists circled around waiting for a vacancy or they retreated to side streets hoping to confiscate a space in front of someone’s home. Needless to say, this sometimes became the predecessor of road rage. Also, this scenario increased traffic volume on Main Street, which slowed down the trolleys, throwing them off-schedule. Lansdale’s town fathers, police and merchants recognized the need to deal with the parking issue as the 1930s drew to a close. Then came World War II, gas rationing and the forced need to walk whenever possible. A solution to the problem could wait, but everyone involved knew they would face the problem once again when peace was declared. With the war’s end, prosperity flourished, rationing disappeared and auto production resumed for the first time since 1941. Almost overnight, two-car families popped up everywhere and Lansdale’s downtown parking problem returned in spades. The war gave local leaders time to consider possible fixes. By 1950 they settled on a parking lot to be built on the Hartzel Feed and Grain property between the Bethlehem Branch of the Reading Railroad and a block of West Main Street stores. 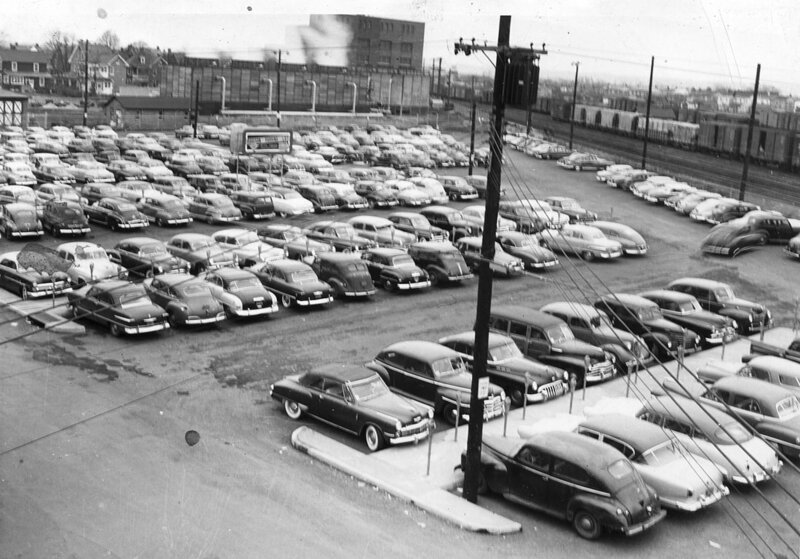 The lot filled to capacity as soon as it opened in 1951. The Madison Lot drastically improved the town’s parking situation, so much so that the borough considered adding two additional parking lots in the years that followed. Then the tide turned. The Montgomery Mall opened in the late 1970s. Combined with a half-dozen shopping centers and a plethora of big box stores, it sapped retail business from downtown Lansdale. Now the issue has come full circle. The Madison Lot will soon be replaced by a commuter-friendly residential development. If this extensive project does breathe new retail life into downtown Lansdale, will there be enough available parking? Lansdale’s leaders at the end of World War II saw the parking problem as a positive byproduct of a healthy, vibrant business district and dealt with it accordingly. Perhaps if history does repeat itself this time, the result will be equally good.